Microsoft Office Small Business 2007 is a powerful and easy-to-use suite of productivity and contact management software with new tools to help you save time, stay organized, and deliver better customer service. Easily manage your prospect and customer information in one place. Quickly create dynamic documents, spreadsheets, and presentations. Develop professional-looking marketing materials for print, e-mail, and the Web, and produce effective marketing campaigns in-house. You can manage your calendar, tasks, and e-mail more efficiently, and filter out unwanted e-mail messages to help keep your computer safe and secure. And you will spend less time learning new features by using improved menus that present the right tools automatically!! Packaged in a Double Jewel Case with Custom Plastic Packaging. New tools in Office Small Business 2007 help you work faster and create more professional documents, spreadsheets, and presentations. 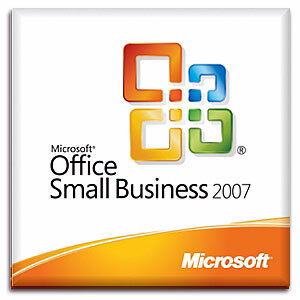 Office Small Business 2007 helps you quickly accomplish routine tasks so you can spend more time with your customers. New task-based menus and toolbars automatically display the commands and options you can use, making it faster and easier to find the software features you need. And the new Live Preview feature makes it easy to sample your changes before you apply them. Schedule tasks in Microsoft Office Outlook 2007 that will appear on your calendar. Use new Microsoft Office Word 2007 templates and tools that make it easier to reuse content, apply professional-looking formatting, and quickly preview changes. Use new Microsoft Office Excel 2007 tools for filtering, sorting, and visualizing information to help you analyze business data more effectively. In Office Outlook 2007, you can drag tasks onto your calendar. Microsoft Office Outlook 2007 with Business Contact Manager includes a complete contact management solution for small businesses to help you deliver better customer service. Office Outlook 2007 with Business Contact Manager enables you to organize all of your contact, prospect, and customer information, so it’s easier to manage prospects, respond to customers, and manage your sales process in one place. You also can track and manage project tasks and transfer tasks to coworkers. Centralize contact, customer, and prospect information in one place — including communications history, projected sales value, probability of closing, and tasks. Record all types of communications with a customer in one place — including all e-mail, phone calls, appointments, notes, and documents. Use a consolidated view of your sales pipeline by using a variety of flexible reports that you can easily modify for your unique business needs. Work offline on your laptop or Pocket PC, and then synchronize data when you return to the office. Track project-related information in a single location — including e-mail messages, meetings, notes, tasks, and documents — and easily assign leads, contacts, customers, and tasks to other users. Office Outlook 2007 with Business Contact Manager combines contact, customer, and project information in one place. Create and distribute professional-looking marketing materials and campaigns for print, e-mail, and the Web by using Microsoft Office Publisher 2007. Use Office Outlook 2007 with Business Contact Manager and Office Publisher 2007 together to track and manage marketing campaign activities, including compiling mailing lists, distributing materials, and tracking your results. You also can use the library of customizable templates in Microsoft Office PowerPoint 2007 to create professional-looking presentations that enhance your business identity. Use hundreds of professionally designed and customizable design templates and more than 100 blank publication types. Reuse text, graphics, and design elements and convert content from one publication type to another. Combine and filter mailing lists and data from multiple sources, including Office Excel 2007, Office Outlook 2007, Office Outlook 2007 with Business Contact Manager, and Microsoft Office Access 2007 to create personalized print and e-mail materials and build customized collateral such as catalogs and datasheets. Create, manage, and track marketing campaigns. Create more dynamic presentations by using an extensive library of customizable themes and slide layouts. Create powerful charts, SmartArt graphics, and tables, and quickly preview formatting changes. Use PDF file format for easier document distribution and high-quality printing. Produce professional-looking marketing materials for print, e-mail, and the Web using Office Publisher 2007. Microsoft Internet Explorer® 6.0 with service packs, Microsoft Exchange Server 2000 or later required for Office Outlook 2007 users. To install Office Outlook 2007 with Business Contact Manager, you need to first install Office Outlook 2007. Other Certain inking features require running Microsoft Windows XP Tablet PC Edition or later. Speech recognition functionality requires a close-talk microphone and audio output device. Information Rights Management features require access to a Windows 2003 Server with SP1 or later running Windows Rights Management Services. Connectivity to Microsoft Exchange Server 2000 or later is required for certain advanced functionality in Outlook 2007. Dynamic Calendars require server connectivity. Instant Search requires Microsoft Windows Desktop Search 3.0. Connectivity to Microsoft Windows Server 2003 with SP1 or later running Microsoft Windows SharePoint Services is required for certain advanced collaboration functionality. Microsoft Office SharePoint Server 2007 is required for certain advanced functionality. Internet Explorer 6.0 or later, 32 bit browser only. Internet functionality requires Internet access (fees may apply). Additional Actual requirements and product functionality may vary based on your system configuration and operating system. *512 MB RAM or higher recommended for Outlook Instant Search. Grammar and contextual spelling in Word is not turned on unless the machine has 1 GB memory. *The Office Clean-up wizard not available on 64 bit OS.